Sony’s animated Spider-Man: Into the Spider-Verse has dazzled critics and moviegoers with its smart plot, unique animation, and everything but the kitchen sink mentality. It’s even earned itself an Oscar nomination for the 2019 awards ceremony! One of the things the film is most adored for is its use of diverse and deep-cut characters, and the acting and the writing for each one is quite sharp. However, the main thing geek audiences love is that each Spider-person (and pig!) featured is an important part of Marvel’s Spider-Verse history. Have you ever wondered where each of these Spideys originated? Read on to find out! 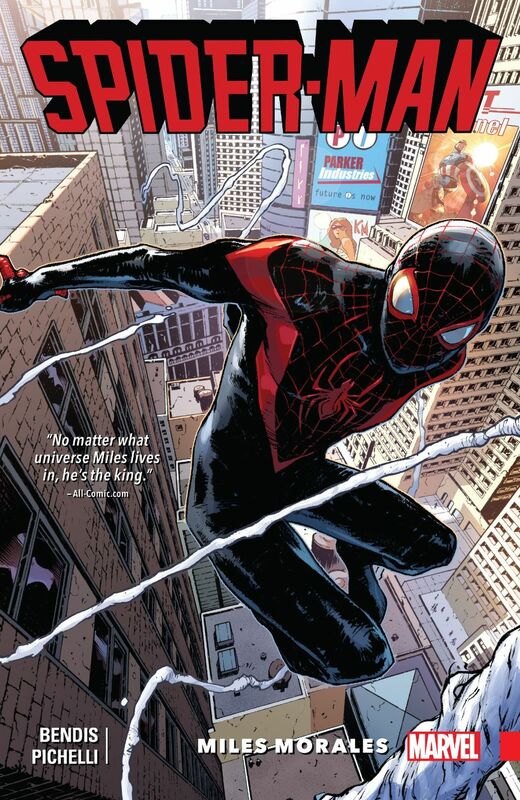 The Spider-Verse comics began running in 2014, showcasing many Spider-people from alternate dimensions. One hero who spun out of Spider-Verse was a beloved character known by fans since 1965 as Gwen Stacy, but this time with a twist—she was bitten by the spider, not Peter. First appearing in Edge of Spider-Verse #2 as Spider-Woman, Spider-Gwen (now also known as Ghost Spider) exists within the dimension known as Earth-65. Many of the stylistic and story attributes from her first comic appearance were carried over into her portrayal in film, such as being the drummer for a rock band and fighting against her friend Peter Parker, who was transformed into the Lizard in their universe. Unfortunately, Peter died from the struggle, and Spider-Woman is blamed by the public for his death. Gwen Stacy was created by Stan Lee and Steve Ditko, but the idea to use her as a Spidey came from Dan Slott. Her origin story arc was written by Jason Latour, and her look was designed by Robbi Rodriguez and colored by Rico Renzi. She was a hit with fans, and ended up with her own comic series after the initial Spider-Verse issue. 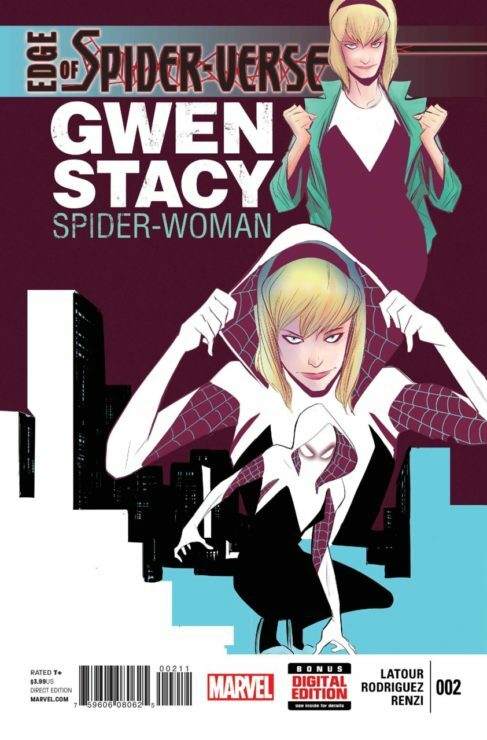 The character has also appeared in other stories as Gwenom, Gwenpool, and Gwen-Goblin. 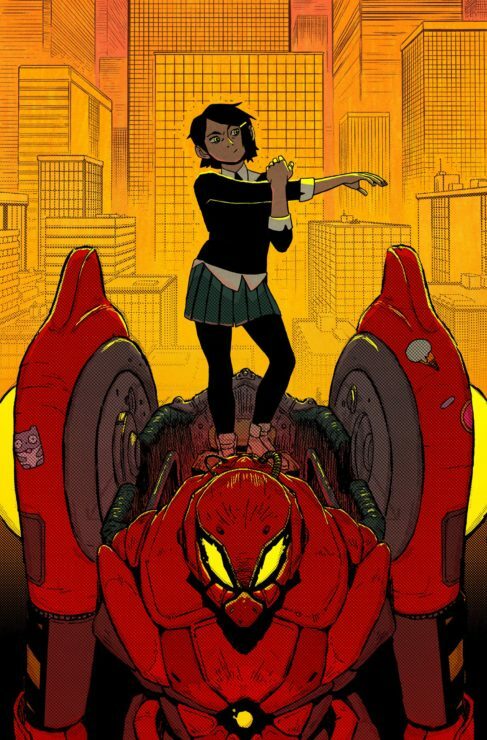 Perhaps one of the most unique of the Spider-people, Peni Parker was first introduced in Edge of Spider-Verse #5, a psychedelic piece of Spider-Man sci-fi written by none other than Gerard Way of Umbrella Academy and My Chemical Romance fame. The narrative introduces Peni as Peter Parker’s daughter. Until his death, Peter piloted a weaponized mechanical suit known as the SP//dr. To connect to the suit, one had to be bitten by a specially engineered radioactive spider. While developing the concept, Gerard Way thought it would be interesting if the spider that bit the hero never left, and it was therefore added as an important component between the suit and its pilot. Peni then carries on her father’s legacy, piloting the SP//dr suit and battling foes like Mysterio in her first appearance. For the Spider-Verse film, Peni’s visual design, inspired by various anime styles, was exaggerated to a point where she looked significantly different from the comics, and her personality was made a little more lighthearted and whimsical. 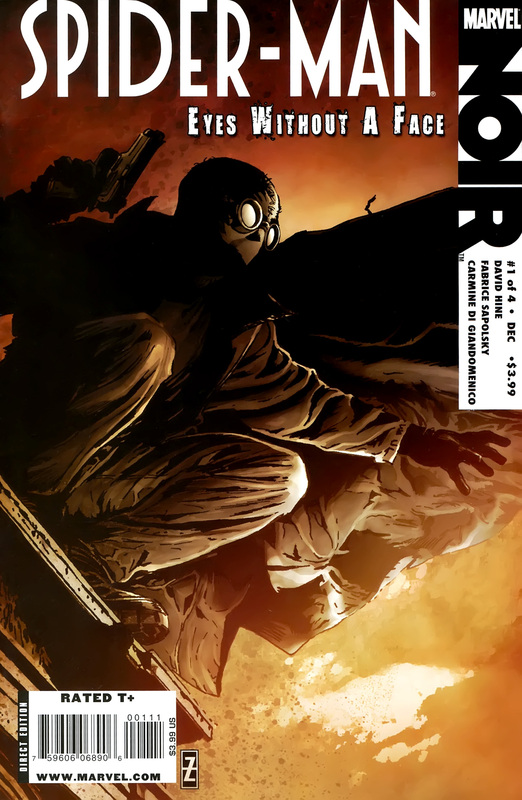 Spider-Man Noir first appeared in the eponymous comic of 2009 as a part of the Marvel Noir story line. The character was created by writers David Hine and Fabrice Sapolski and artist Carmine Di Giandomenico. It’s a much darker take on everyone’s favorite web-slinger, as the character actually uses guns rather than his powers alone. This time around, Peter Parker is a reporter’s apprentice in the 1930’s. In his world, Norman Osborn is the Goblin, a fearsome man with a criminal empire. One of the many artifacts stolen by the Goblin’s team included a spider statue that broke and released living spiders, one of which actually bit Peter and gave him his powers. Peter soon discovers that rather than working to bring the crime lord down, his boss was actually blackmailing the Goblin in exchange for money. This sets events into motion that eventually led to Peter donning an intimidating costume and becoming Spider-Man Noir. The Spider-Verse film features a Spider-Man Noir character that mostly stays true to his comic origins, though with the grit toned down along with a few changes to his appearance. He was voiced by Nicolas Cage. Peter Porker, despite being quite ridiculous, is a lovable character. He was created by Tom DeFalco and Mark Armstrong, first appearing in a comic in 1983. He’s pretty much the same as Spider-Man—except he’s a pig. A cartoon pig. Porker’s universe is populated by talking animals, but in an interesting twist, he started life as a spider before becoming a mutant hero. He lived in the basement of May Porker, a porcine parody of Aunt May. She conducted radioactive experiments with a hair dryer, and she was the one to bite Peter while he was still a spider. Her irradiated bite transformed him into a pig like herself, but with the abilities of a spider. 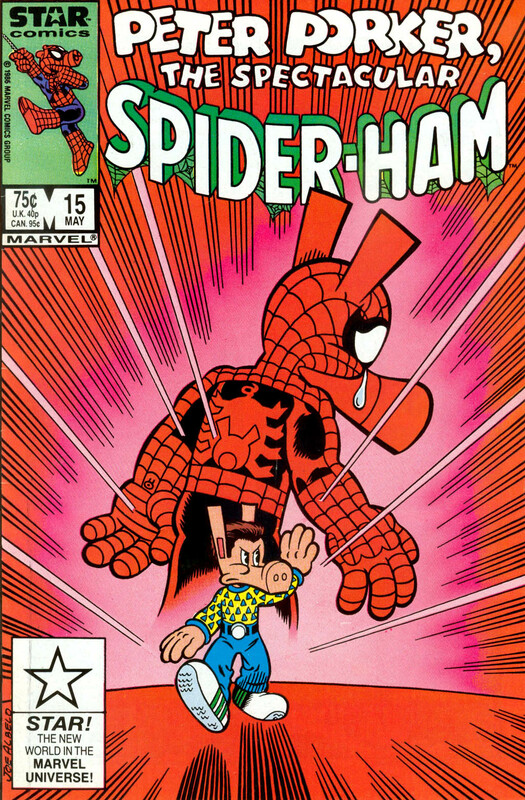 Spider-Ham’s appearance in the film brought in a lot of comedy, as former SNL scribe John Mulaney provided his voice. The character is referred to by a villain in the film as a “cartoon”, but the bad guys soon learn that this pig should never be underestimated. Also, he carries an ACME inspired hammer that can fit in his pocket. This version of the web-slinger turned up in the movie’s end credits stinger, much to the joy of fans. It’s unclear as to whether he will appear in a sequel or spin-off, but we’ll keep our fingers crossed. The character was originally created as a part of Marvel’s 2099 run, which featured futuristic versions of a number of beloved characters. 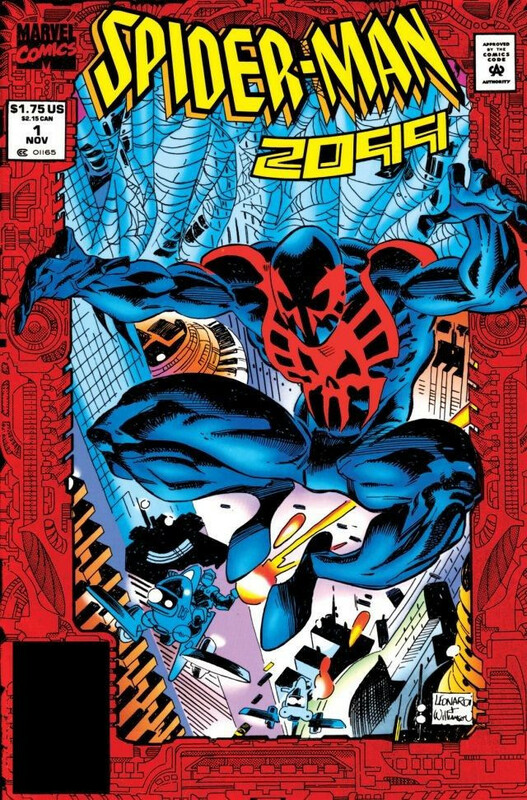 His alter-ego, Miguel O’Hara, was a geneticist for Alchemax corporation in the future of 2099. He attempted to create new Spider-People through genetic alterations, as heroes were long-gone in this universe. When his experiments failed, he wanted to resign from the project, but was tricked into taking an addictive DNA-altering drug called Rapture. To free himself from the addiction, he connected himself to his experiment, but a jealous colleague had interfered with the machines, and Miguel would end up rewriting his own genetic code with 50% spider DNA. Since his first issue, the Spider-Man of the future has appeared in many of his own comics and crossovers, eventually showing up in the Edge of Spider-Verse comic series, which paved the way for his appearance in film. In addition to the classic Spidey powers, he has many unique abilities including sharp teeth and claws, paralyzing venom, and a nearly indestructible suit constructed of Unstable Molecule Fabric. He can also move at lightning speeds, so fast that it leaves a decoy behind that can distract enemies. Miles Morales- a very human spider. Finally, we come to Miles Morales, the main hero of the Spider-Verse movie, and quite arguably the coolest of these amazing characters. Sure, his suit looks awesome and he has some unique powers, but it’s his human attributes that have really won audiences over. He’s awkward, cool, brave, fearful, and rational all built into one – the Spider-Man that’s the most like the rest of us. For example, even after receiving spider powers, most people would think twice before jumping off a building and testing out the web-slinging. Though the other Spideys (at least in film, anyway) did experience some trepidation about this, most of them of seemed impossibly brave right from the beginning. Miles, on the other hand, initially backs out from jumping off a building, heading down the stairs and then back up again once he finds a shorter rooftop. He also struggles with a lot of self-doubt, and it gives the movie some surprisingly deep dimension as Miles slowly discovers his courage, his confidence, and his role as one of the coolest superheroes in history. First appearing in 2011, Miles was created by writer Brian Michael Bendis and artist Sara Pichelli. His origins took place years before the Spider-Verse story lines, and he was part of a separate continuity from Marvel’s main series, a continuity in which Peter Parker dies called the Ultimates universe. Miles stepping up in place of the original Spider-Man as well as his complex family history were both carried over into the Spider-Verse film. He also has the ability to turn invisible, and he can produce a paralyzing electric current called a venom blast, both seen in action in the movie. Across every universe, there are hundreds of heroes who wear the mask. Stan Lee said it best in his touching Spider-Verse cameo, the mask always fits in the end. Who’s your favorite Spidey? Sound off in the comments, and Let Your Geek Sideshow!